My Virtual Sundial is based on one in Carl Sabinski's "The Sundial Primer" website. A Cycloid Polar dial is interesting because of its unusual curved gnomon which allows the hour lines to be equally spaced. See Carl's webpage: http://www.mysundial.ca/tsp/cycloid_polar_sundial.html for all the details of how to design and make it. My small contribution is to enable it to be a Standard Time Cycloid Polar dial. Because, like an Equatorial dial, the hour lines are equally spaced, the dial can be adjusted from the solar time to standard (or clock) time, with the two adjustments, the Equation of Time, varying between 14 minutes 20 seconds slow and 16 minutes 23 seconds fast and the longitude correction, in the case 2 deg 22 min. West or 9 minutes 28 seconds of time. The gnomon is not fixed and can "slide" along the dialplate in the East-West direction. 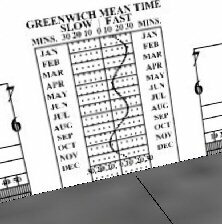 This enables the user to align the gnomon line at the correct day and month on the correction graph. As you can see from the model , it was 26th June at 13:00 hr. British Summer Time. 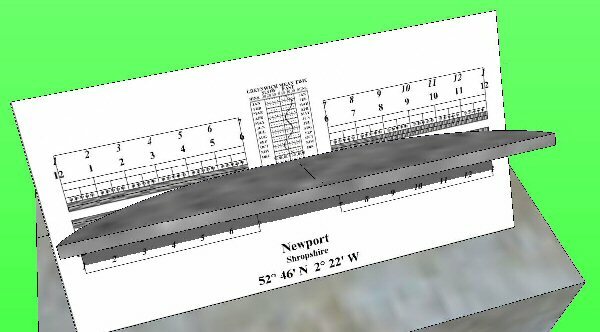 which are very useful for experimenting on Google SketchUp Sundial models.